Frankenstadion. 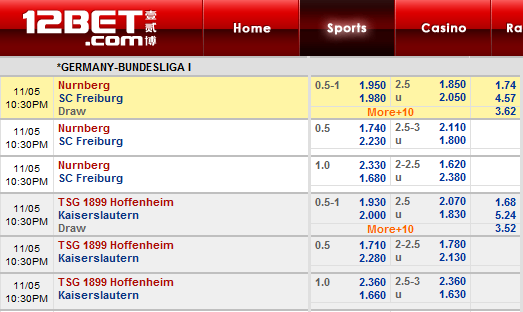 On home ground Nurnberg has won 1, drawn 3 and lost 1 matches. This ranks Nurnberg 14th in home team performance in the German 1 Bundesliga.Freiburg has played 5 German 1 Bundesliga matches this season away from home. On away ground Freiburg has won 0, drawn 1 and lost 4 matches. This ranks the Breisgau-Brasilianer 18th in away team performance in the German 1 Bundesliga. Freiburg that is currently placed in the bottom 6 of the German 1 Bundesliga Nurnberg has managed to collect an average of 1.33 points in 3 matches this season. Concerning matches played at home against the bottom 6 this season Nurnberg has collected 2 points on average in 2 matches.